A new and increasing trend has been seen through the past few years. New investors have emerged in the hotel industry, including private owners of U.S. army hotels, and professional athlete investors. These hotel properties are undergoing renovations and building updates. These updated hotels present excellent tax incentive opportunities and are favored within EPAct legislation compared to the EPAct standards. 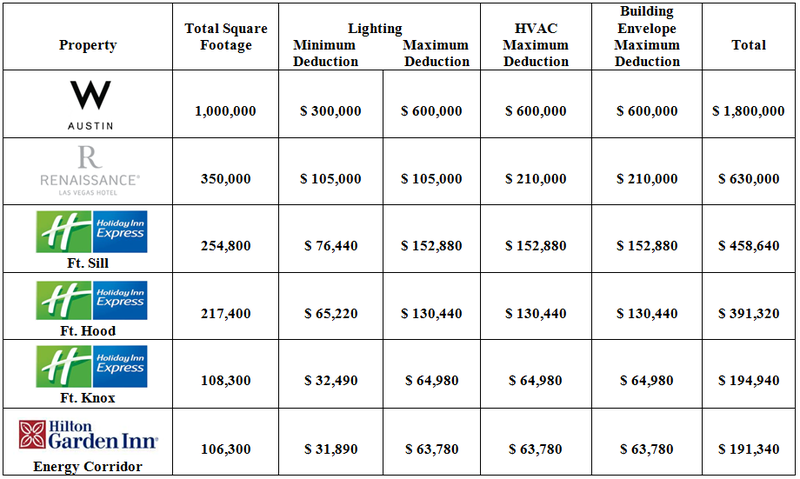 The table below presents the EPAct tax deduction opportunities for some of the new hotel investor groups’ locations. *Total square footages are based on internet data. Throughout the country, the U.S. Army has been privatizing their hotels. The Privatization of Army Lodging (PAL) program creates opportunities for larger companies to build upon, renovate, and operate these hotels. This is a way for these Army lodging locations to modernize their facilities while saving money. Fort Hood is America’s largest Army base and is a good example of what to expect at other Army bases in the future. The Fort Hood hotel in Texas is the most recent transition with 250 rooms renovated. This innovative 217,000 square foot Holiday Inn Express hotel now includes marble countertops, flat screen TVs, and an outdoor pool. InterContinental Hotels Group has Army hotels in 15 states and a three phase plan including another 8,800 rooms throughout numerous bases. The Hilton hotel chain’s investors within the past year include leading professional ex-athletes such as David Robinson (formerly of the San Antonio Spurs), Magic Johnson (formerly of the Los Angeles Lakers), and Glenn Davis (formerly of the Houston Astros). Within the past year David Robinson, through Admiral Capital Group, has acquired the 106,000 square foot Hilton Garden Inn in Houston, the 350,000 square foot Renaissance Hotel in Las Vegas, and plans to purchase a third property in Dallas. Glenn Davis has ownership of two Hilton hotels in Ohio and one Marriott being constructed in Georgia through his investment fund, Cascade Group. As a very successful ex-athlete real estate investor, Magic Johnson has acquired the Hilton Washington, D.C., W in Austin, Hotel Icon in Houston and nine others through the Canyon Johnson Urban Fund. The joint venture will also be purchasing an additional three or four hotels within the upcoming months. The ASHRAE rule set uses inefficient PTAC units in the reference building for tax savings. A hotel with a centralized chiller system is very energy efficient compared to hotels that utilize PTAC units. Central HVAC systems are common in large hotels and are another favored EPAct category. The U.S. Army hotel properties were renovated and modernized when purchased by InterContinental Hotels Group and many of the ex-athlete owned hotels have either been recently updated or are in the process of being built. These new hotel investors stand to gain large EPAct tax deductions, especially because of the favorability of the hotel building category in EPAct. 1 - “The Army Calls In the Hoteliers” The Wall Street Journal, Business. June 13, 2012, Page B6. 2 - “Hotels a Win for Ex-Athletes” The Wall Street Journal, The Property Report. June 13, 2012, Page C6. 3 - Charles R. Goulding, Jacob Goldman and Taylor Goulding, “Hotels and Motels Most Favored Energy Policy Act Tax Properties” Corporate Business Taxation Monthly, March 2009, Pg. 17-18. 4 - Charles Goulding, Jacob Goldman and Daniel Audette, “The EPAct Aspects of Hotel LED Lighting” Corporate Business Taxation Monthly, December 2011, Pg. 21-23.